Hunting down Heller | The M.o.B. Way back in the days when cars were made of steel and gay meant happy, there were only a handful of manufacturers making small tanks. There was Airfix of course, fellow Brit manufacturer Matchbox, Esci from Italy, and Japanese trio Hasegawa, Nitto, and Fujimi. It was like the days when Saturn was thought to be the extent of the solar system. What I didn’t know at the time was that just over the horizon was another maker, Heller, who made a small range of five AFV kits. These had long since ceased to be produced. Now these weren’t exactly marvelous, but the topics were unique, and notably French. A decade later I bought a resin kit of a Somua S35. As I later discovered, it was not an original but a copy of Heller’s kit. Recently Heller became part of Airfix which had gone bust for the 14th time, and are now owned by Hornby. 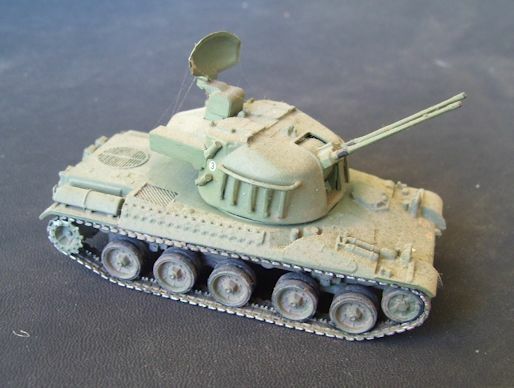 This has led to ‘new” Heller kits of the M4 Sherman and Tiger, Airfix offerings dating from 1961 and 1964 respectively. However the best thing was that cross-pollination produced was (is) the slow re-release of the original Heller range. These re-released Hellers are dirt cheap too. The Somua mentioned previously was basic but fine, nothing wrong with it. There is not a lot of scope for conversion, about the only thing you can do with a S35 is to put black crosses on it. Appearing at the same time as the Somua was the second of the original Heller range, the AMX-30 tank, again quite acceptable except for one thing: the tracks and sprockets. Vinyl tracks were the norm in the sixties, and if done properly are fine. Four of the Heller kits featured vinyl tracks that were about as thick as a fan belt and just as flexible, and just as devoid of detail. Somehow the Somua escaped this fate. The sprockets on the Heller tanks are just round, no teeth. However the solution is simple. At some point the French decided to replace the original dry pin tracks on their AMX-30s with rubber bushed live track, just like that used on the Leopard I. The sprockets and tracks from the Airfix Leopard are a perfect replacement. 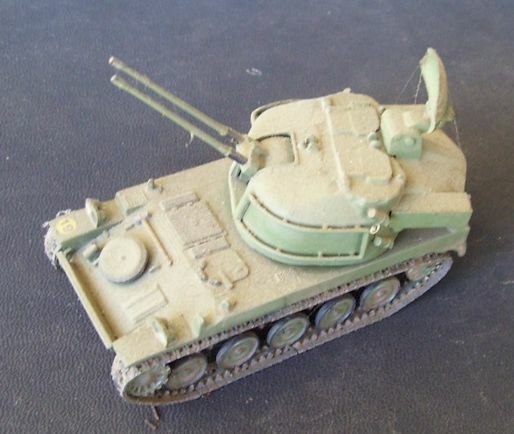 The next of the Heller kits that I found several years ago was the AMX-13 DCA, which might stand for Deux Cannon Avion, or something like that. The DCA was an air defense tank carrying a pair of 30mm guns and a radar in a big turret. The AMX-13 DCA had tracks that made the AMX-30 look good. The problem here was that there isn’t a lot to replace them with, unusually they have two guide horns for single road wheels. Panzer 38(t) or Hetzer track appears to be the best bet. For reasons I can’t recall my DCA has resin tracks, that look like copies of Hetzer track. The sprockets were still toothless, but I had fixed that by filing some teeth in the part not covered by track. 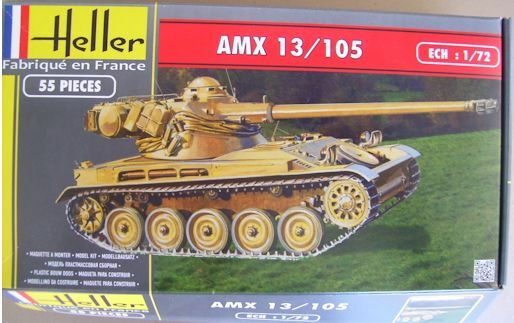 Earlier in 2014 I bought the fourth kit, the AMX-13/105. You probably expect me to san there is only one thing wrong with this kit, but you would be wrong. There are two things wrong. The other is the turret. 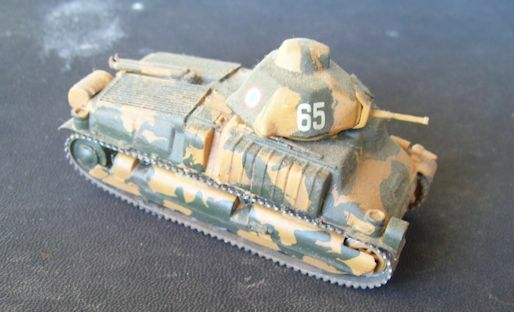 One idiotic French idea was the oscillating turret, where the gun is fixed in the upper part, which tilts forward or back with the turret crew and everything in it. The kit doesn’t do this, so that needs to be fixed. As for the tracks, these appear to be fan belts, but are somewhat thinner than the originals. Lacking enough spare Hetzer track, I will use the kit tracks, with the idea to replace them when something better comes along. The last of the original Heller range is the AMX-30DCA, and this is the one I am waiting for. I am guessing that it involves the AMX-30 hull with the same turret as used on the AMX-13DCA. Here’s one I lashed up, but the Quest is not over until I get my hands on a box printed with AMX-30DCA.